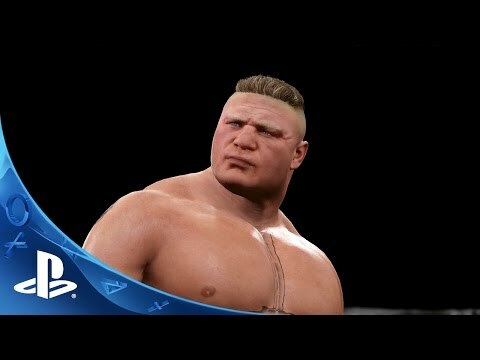 Welcome to Suplex City, courtesy of the cover beast Brock Lesnar! WWE 2K17 returns as the reigning, defending, champion of fighting video games. Experience the most authentic, responsive, and action-packed WWE gameplay ever, with thousands of new moves and animations, backstage brawling and the biggest roster of WWE and NXT Superstars to date. Create and develop your custom WWE Universe with the deepest Creation Suite to date, featuring new options such as Create a Video, Create a Victory and a Highlight Reel system. New features and additional content allow you to customize the most amazing Superstars, Arenas, and Championships. The all-new Promo Engine brings the drama and personality of the WWE Superstars to life in MyCAREER and WWE Universe modes. Choose your words wisely and smack talk your opponents, start rivalries or form alliances. Your dialogue will shape your characters as they rise through the ranks of NXT and WWE to become WWE Hall of Famers! Soundtrack by Sean "Diddy" Combs aka "Puff Daddy"
© 2005-2016 Take-Two Interactive Software and its subsidiaries. 2K, the 2K logo, and Take-Two Interactive Software are all trademarks and/or registered trademarks of Take-Two Interactive Software, Inc. Developed by YUKE’S Co., Ltd. YUKE’S Co., Ltd. and its logo are trademarks and/or registered trademarks of YUKE’S Co., Ltd. All WWE programming, talent names, images, likenesses, slogans, wrestling moves, trademarks, logos and copyrights are the exclusive property of WWE and its subsidiaries. © 2016 WWE. All rights reserved. All other trademarks, logos and copyrights are the property of their respective owners.